FAA Written Test - Passed! Today I got up and cooked a big breakfast and studied one last time for the FAA knowledge test. 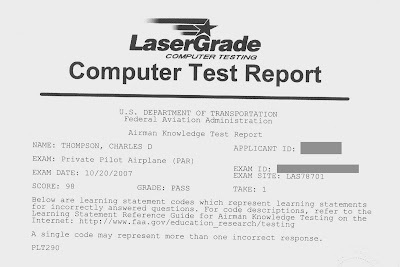 My FAA written test (now called a "computerized" test) was scheduled for 1pm today out at Virgil Kennedy's place at the airport. I got started late because the test proctor was slow to show up. It was hot in my test cubicle but fortunately the owner came by and noticed how uncomfortable it was and cranked down the temperature. I wrote down all of the VFR minimums for Class B,C,D, E and G airspaces on a piece of paper so I would not forget them. I was nervous but finally got into the groove. I was very careful to re-think and re-check each question before selecting my answer on the multiple-choice test. Got finished in about 1.5 hours (2.5 hours is allowed for the test) and was amazed that I didn't have more E6-B "whizz-wheel" questions on the test. So all-in-all the navigation portion was pretty easy. Don't be fooled I just got the luck of the draw on this particular test. 60 questions out of a pool of 600 makes for different test questions for each applicant. I'm glad that this is behind me and that I scored a "98" on the test! This will make my oral exam just a little bit easier!